This week finds WineGuyMike™ on the road again to a region of terrior that I love, the Willamette Valley of Oregon. More accurately I am visiting with my very dear friend Molly the Wine Dog, oh yeah and her assistant Kelly Styring from Styring Vineyards. I think it is only appropriate to give a shout out to Steve Styring, proprietor and winemaker, as well seeing how he is the man that makes the juice that we love to drink. I want to point out that I have not had the good fortune to visit the winery yet, but I will be in a few weeks. I also have not tasted Styring Vineyards wines yet but will be doing that soon too. Styring Vineyards is a small boutique winery on forty acres that produces award winning wines that are great according to my wine spy over in the Willamette Valley. The winery produces 500 to 1000 cases of wine each year. Styring produces limited case lots of handcrafted Pinot Noir, Riesling and other varietals that thrive in our growing region. The winery has no employees other than spot labor and friends and volunteers. I became interested in Styring Vineyards first by meeting my friend Molly the Wine Dog on Twitter. Upon further investigation and things Molly shared with me I learned a little more about the Styrings and their journey from corporate America to the Willamette Valley of Oregon. This by the way if you haven’t noticed is some of my favorite wine country. She is Molly the Wine Dog, Chief Odor Detection Officer and Official Blogger for Styring Vineyards, located in the beautiful Willamette Valley, Oregon. Molly is the official spokesdog for the winery. She is Miss November in the Wine Dogs Calendar and has more than 3200 followers on Twitter. She’s also active on facebook (Molly Styring) and has a blog called Adventures of Molly the Wine Dog. She posts a little of everything from stories of the vineyard, video, skunk adventures and recipes. I also post pictures visitors send, thank you cards, open house announcements, etc. Kelley and Steve Styring; In their past lives before they became grape farmers Steve was a system architect with Sun Microsystems and Kelley was Director of Market Research for Frito-Lay. They lived in Dallas TX, but were originally from and raised on the east coast. Kelley and Steve visited Oregon on vacation with the idea of becoming grape farmers and met David Teppola, founder of Laurel Ridge and David Hill wineries. While visiting David’s tasting room the Styring’s shared their dream with him. David closed up shop, locked the front door, wine was being tasted and shared, and a life changing conversation ensued. The Styring’s packed up their belongings and moved to that very special place in Oregon, the Willamette Valley. Kelley and Steve apprenticed with David until his death in early 2006 from cancer. Styring Vinyards opened for buiness in 2005 and have never looked back. The Styring name is Viking in origin, documented back to the Year 700 A.D. when Styr the Strong left Sweden to take what is now Sheffield, England. The Styring history in England is linked with farming as far back as 1100 A.D. The Styrings who did not take up farming and continued as cutlers perished “at their profession” according to family documents. It’s a good thing our ancestors liked to farm! Learning from the error of the families ways Steve and Kelley decided to become famers, I suspect this was good advice from Molly. 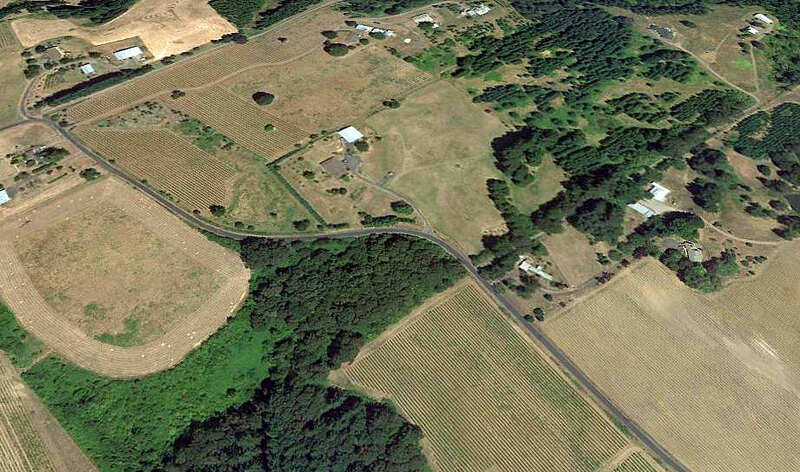 Styring Vineyards was established by Steve and Kelley in 2003 on a 40 acre parcel of unfarmed land in the Ribbon Ridge AVA, upper Willamette Valley, Oregon. The Styring Vineyards principal is to produce small lots of hand-crafted Pinot Noir and Riesling with an authenticity you can taste. 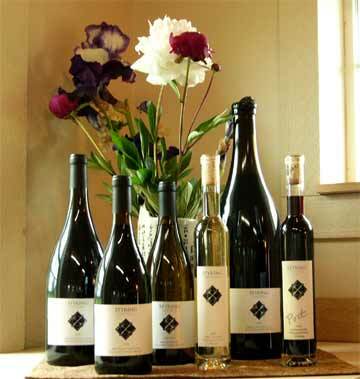 Their winery is a voucher for the intimate ties between the vineyard and the wine. Everything they do in the vineyard matter as much as what they do in the winery. Their mentor David Teppola was a great influence for the Styrings. He understood the terrior of the Willamette Valley and imparted his knowledge, experience, and wisdom of farming and winemaking to the Styrings. Thank you David. Styring Vineyards won a gold medal at the NW wine summit for their first Pinot Noir, a 2003 vintage. Their 2006 Pinot Noir received “best in Oregon” at the same show. Just when you thought it couldn’t get any better the Styring Vineyards 2008 Estate Pinot Noir scored a Wine Advocate 92. This will be released this Memorial Day Weekend. I love the focus of producing great wines from the Pinot Noir and Riesling grapes. It’s a no secret that these cool weather varietals produce well in the Willamette Valley. What I love about these two grapes is the personality they express in the bottle from the land which they come from, yes folks that’s what we call terrior. These are grapes with a sense of place, and Steve knows how to make it happen in the glass. You can see a consistent pattern here; the wines Steve and Kelley are producing under the supervision of Molly the Wine Dog just keep getting better. Styring Vineyards produces small lots, carefully nurtured from vine to barrel to bottle, that reflect the authentic nature of the fruit, exacting standards, and the character of our Willamette Valley growing region. At Styring Vineyards, they believe in crafting artisan wines that they enjoy drinking. That means carefully grown fruit, handled with care, and coaxed into wine that expresses the unique character of the grape, the terroir, and their personality. This is typified by our small case production from limited varietals that love the Willamette Valley of Oregon as much as they do. Styring Vinyards produce dry, flavorful whites; complex, structured reds; and fruity, balanced dessert wines — enjoyable now, but when carefully cellared, robust enough for the best collections. Our Ribbon Ridge AVA is uniquely suited to grow some of the finest Pinot Noir in the world. We then carefully crop the fruit, a time-honored tradition, to yield Pinot Noir of exceptional quality. After careful fermentation, gentle handling, and up to two years in French Oak barrels, this wine is a rich with characteristic structure – blackberry and black cherry fruit up front and soft, full tannins on the finish. The Pinot is offered in both Reserve and Barrel Select varieties. Severe southern slopes in the Willamette Valley yield the perfect conditions to display Riesling in its dry form. Simple, yet elegant, with crisp apple notes and a clean, finish – our Riesling offers a true balance of fruit and acidity. The Riesling is bottled in a slope shouldered bottle as a companion to our Pinot Noir. The Styrings have always enjoyed dessert wines and sought to produce one from the finest Riesling fruit. Their dessert wines are lower in sugar than a classic dessert wine, allowing tangerine and apricot notes to push through to a clean, soft finish. The Port-Style wines reflect the best of our reserve quality, fortified with 100% wine spirits, for a full, rich port-style experience. Let them know that WineGuyMike™ sent you, and say hello to Molly for me.